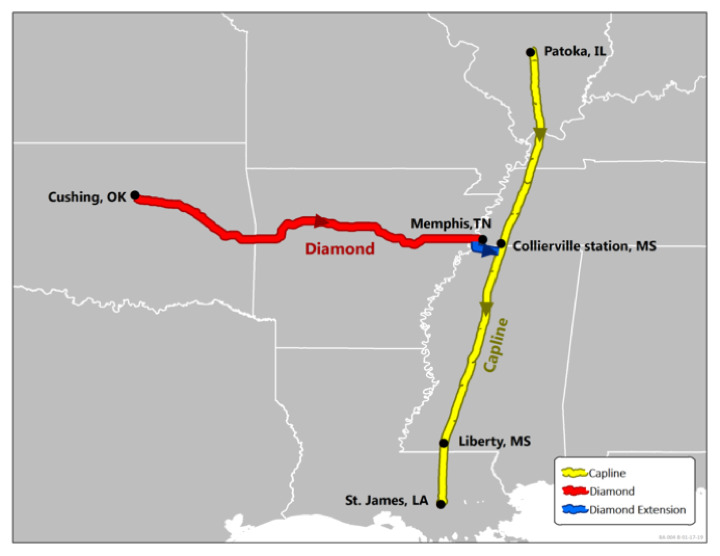 Capline Pipeline Company LLC, a joint venture among the pipeline system’s owners, has announced that a binding open season is underway to solicit shipper interest for the Capline system’s southbound service from Patoka, Illinois, to St. James, Louisiana or Liberty, Mississippi, with an additional origination point at Cushing, Oklahoma, as part of a joint tariff with Diamond pipeline. Capline is a 40 in., 632 mile pipeline system extending from Patoka, Illinois, to St. James, Louisiana. The reversed service is scheduled to commence in September 2020. The binding open season began on Wednesday 30 January 2019 at 4 pm EST, and concludes on 30 April 2019, at 12 pm EDT. Capline Pipeline Company LLC‘s majority owner is a Plains All American Pipeline, L.P. subsidiary, and minority owners are a Marathon Petroleum Corporation subsidiary and BP Oil Pipeline Company.